Gardening and vegetarianism have two things in common: they’re both fun, but they can also be dangerous. Just think of the consequences of eating one of the most poisonous plants for humans that you just planted in your yard… not pleasant, right? For that reason, it’s always best to know a thing or two about these beings that, despite their beauty, could kill you in a matter of hours. Read on to find out more about poisonous plants and how to identify them. Having no particular preference in terms of weather or type of soil, poisonous plants can grown anywhere. You could find them in the forest near your house, in your backyard or even inside your house. Yes, flowers can have a deceptive beauty sometimes, and as such, they can represent a bit risk, especially if there are children or pets in the house. Therefore, the more you know about them, the better prepared you will be next time you spot one, either in nature or at the flower shop. Currently holding the Guinness World Record for the most poisonous plant in the world, castor plants are the same ones that we exact castor oil from, ironically a great home remedy for a variety of health issues. Its seeds have high concentrations of a toxin called ricin. If a raw bean is chewed and swallowed, it can cause extended damage to our health. Humans are the most sensitive creatures to it. In fact, 4 beans are enough to kill a person in 2 days, causing a long and agonising death. It takes 80 beans to kill a duck. Commonly found in school yards and in flower shops, this plant is able to induce you into a coma and sometimes even cause death. Its toxins are so strong, that there have been cases of people reporting skin irritations after barely touching a leaf, especially children, and some even becoming ill after eating honey that had been made by bees that enjoyed some Oleander’s nectar. Its poison can cause heart issues, digestive upset and even death. Also known as Crab’s eye or jequirity beans, this tropical plant can be found twining around trees and shrubs anywhere in the world. Its orangey red seeds, commonly used for prayer rosaries, contain abrin, a type of poison similar to ricin (found in other plants), only 75 times stronger and thus deadlier. It only takes 3 micrograms to kill a human – less than the amount contained within one seed. It’s so dangerous that some people have died by simply prickling their fingers on the bits of the drill that was used to drill wholes in the seeds. Just keep the seeds intact and nothing will happen. This plant, which can be found anywhere in the world, owes its name to its trumpet shaped flowers, which can vary in size (14-50cm) and colours, including white, yellow, orange and pink. The poison it contains is unevenly spread out throughout the entire plant and its level of toxicity can vary depending on the type of plant. Because of this, many have overdosed drinking tea made from it as an hallucinogenic. Always on display early on in the Spring around the northern hemisphere, sometimes even when snow is still falling from the sky, the Star of Bethlehem flowers are a relative of lilies. They contain a poison called cardia glycosides and it’s spread out all over their parts. However, the highest concentration is usually found in the underground stems, otherwise known as bulbs. Their consumption can cause continuous vomiting and nervous excitement. Officially knows as Gelsemium sempervirens, this evergreen is very similar to jasmine and it’s a desirable plant to have in gardens due to its lovely bright colour and their low maintenance characteristics. All parts of the plant contain a fatal poison. If ingested, the first symptoms usually include muscular weakness, lowered temperature, nausea, convulsions and eventually respiratory failure. They may be pretty, but it’s probably best to keep them out of reach, especially around children. The saying goes “Leaves of three, let it be!”, which is very useful to identify some of the most dangerous plants around, such as poison ivy and oak. However, there are many other poisonous types that either have or don’t have leaves grouped into three, thus identifying the can be quite a challenge. Unfortunately there are no general characteristics shared by all poisonous plants, which makes it hard to identify them, though there are a few tricks that may help your internal red alarm go off. As previously mentioned, this is the best way to identify poison ivy and poison oak. If you spot a plant with glossy green leaves with three leaflets each, step away from it and walk the opposite direction if you want to avoid rashes and blisters all over your hands. Plants with leaves of a glossy green colour or dull in shade, are almost certainly poisonous. They usually have teeth like edges and have really smooth leaves. A few examples includes relatives of poison ivy, such as poison wood and oak, as well as stinging nettle. We all knows how dangerous berries can be (ever watched Into The Wild?). Plants that have white or yellow berries, such as doll’s eyes, are off limits. Their berries can cause nausea, vomiting and diarrhea, and can be deadly if ingested in large quantities. If you’re curious about a plant that randomly grew in your backyard or that you found along a hiking trail, wear gloves, grab a leaf and twist it: if it sheds a milky secretion, congratulations, you have found a poisonous plant and you’ve avoided skin irritation. Now walk away from it and hope you’ll never find it again. Some plants with this characteristic are papaya, milkweed and balloon flower. 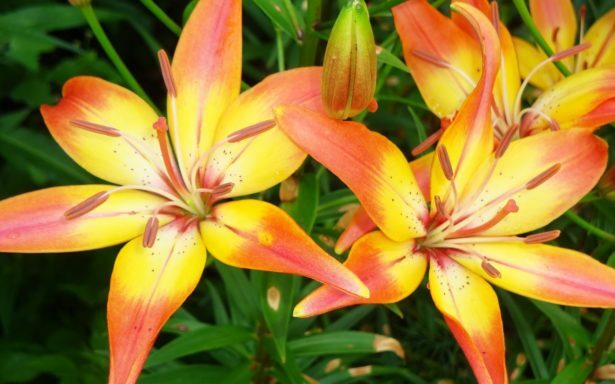 It’s hard to say no to lillies, but when you realise that the mortality rate of its toxicity has been reported at 100% when untreated over 18 hours after exposure, you may want to reconsider if you have a furry friend around. After all, they are known as the most common plant for pet poisoning. The poison is spread all over the plant and eating just small amount of it can cause symptoms such as vomiting, lethargy, depression and death from kidney failure. So although they may be really pretty, it’s sometimes better to be safe than sorry. You may need to be extra careful if you have both daffodils and a cat in your house. Though very aesthetically pleasing, these flowers contain lycorine, a poison able to induce vomiting among other symptoms. Its ingestion can lead your pet to experience diarrhea, abdominal pain and sometimes even respiratory depression. Another very aesthetically pleasing type of flower are azaleas. Ingesting just a few leaves can lead to vomiting, diharrea and excessive drooling. If not witnessed and left untreated, cats could eventually fall into a coma and potentially die.